High school athletes come in all different shapes and sizes and personalities. Successful high school athletes do have one thing in common, though: They share a commitment to being the best they can be and focusing on what they can control, not worrying about the things they can’t control. • Choose and maintain a positive attitude. • Maintain a high level of self-motivation. • Set high, realistic goals. • Deal effectively with people. • Use positive mental imagery. • Manage their emotions effectively. 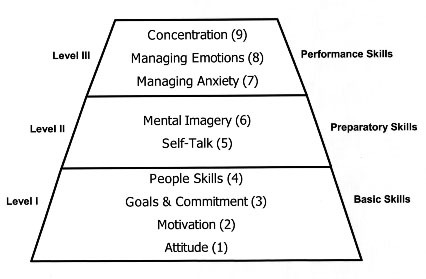 Lesyk created the pyramid below which represents the relationship of the nine skills to one another. Each of the higher levels incorporates and is based upon the skills of the preceding levels. Lesyk’s article details each of these nine mental skills. Successful athletes realize that maintaining is a positive attitude is a choice, and that no matter what, playing the sport is “an opportunity to compete against themselves and learn from their successes and failures.” Lesyk believes that athletes should pursue excellence and not perfection because no one is perfect. By identifying their own form of motivation, athletes are able to “persist through difficult tasks and difficult times, even when these rewards and benefits are not immediately forthcoming.” Lesyk said that successful athletes understand many of the benefits of playing sports come from their participation and not the results. Athletes should establish both short-term and long-term goals that are measurable and have an opening and ending timeframe. Because they are extremely committed to achieving their goals, successful athletes have an easier time carrying out the demands of their training program than others. Lesyk believes that winning athletes “understand they are part of a larger system that includes their families, friends, teammates, coaches, and others.” They can communicate their feelings easily to members of their support group, and listen to the advice that’s given to them. Yet, these athletes have mastered the skills to deal with conflict, criticism or difficult opponents. Winning athletes imagine themselves performing well in competition by creating detailed, specific and realistic images. This skill is not only used to prepare for competition but as a way to recover from poor performance during a game or race. Lesyk believes that successful athletes understand anxiety is part of sport, and “some degree of anxiety can help them perform well.” They also know how to reduce anxiety when it becomes too strong, without losing their intensity in performance. Winning athletes accept that excitement, anger, and disappointment as part of the sport experience, and they develop the ability to use these emotions as ways to improve, rather than having them serve as blocks to performing well. Click here to read the full article. The Ohio Center for Sport Psychology helps people develop the important skills necessary for high-level performance in sport and non-sport performance situations.